is found at the apex of Almiros Bay on the Sea of Crete, with Cape Drapano and its rocky coast to the north and the long sandy beaches towards Rethimnon in the east. Three rivers meet the sea at the village. The largest, Almiros, creates a small harbor for fishing and tourist boats. The entrance to the village on the old road from Chania is a long avenue of eucalyptus trees. Formerly a small fishing village, Georgioupolis now is a tourist village, where still living some fisherman. At a few meters from our house there are tavernas, restaurants and several shops where you will find everything you need. Nevertheless; we live in a very quit street. 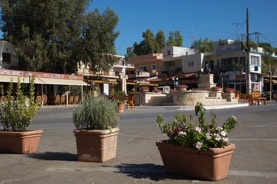 At the central square of the village, 150 meter from Eligas, you will find a pharmacy, as well as cafés and restaurants. In some of them there is live music at times. Cars are not allowed on the village square. This makes it a very enjoyable place. During the tourist season there is a 24/7 doctors post available within walking distance. The about 10 km long beach is the main attraction of the area, with Kalivaki beach on the other side of the river as well. Georgioupolis is a well-located base for exploring the traditional villages of the area towards Vamos or into the White Mountains to the south. Georgioupolis is part of the municipality of Apokoronas. It's town hall and it’s main police station is in Vrissés.